This means that a one-way award is 31,250 miles and $250-$400 in taxes. 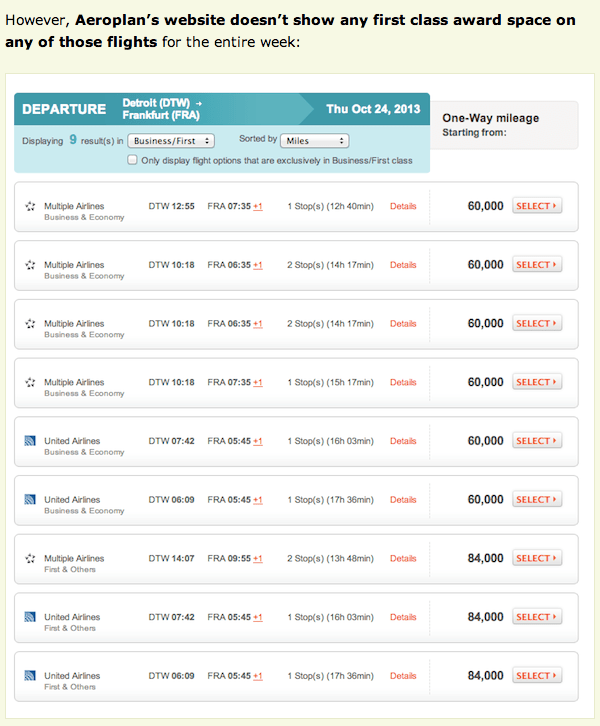 Link to other cities and economy/premium economy discounted cities is here. A 25% discount is not that great in my opinion as that means you pay more than 90,000 miles round trip. In that case, you might as well book with Aeroplan. The other good thing is that many of these awards are now available for 5 months from November 1, 2013 – March 31, 2014, which is longer than previous daes. Blackout dates are from December 18-23, 2013 and from January 2-6, 2014. Note that these are not refundable or cancellable which is the biggest turn off for me. But certainly in some instances they’ll be of great value, and award space is generally not bad on some routes. Flying Blue points transfer from AMEX MR USA and Starwood. Is Aeroplan Blocking Lufthansa First Class Space? Ben says Aeroplan isn’t showing any first class space. My opinion? No. Aeroplan’s search interface has long since only shown three first class results when searching online, so if you search routes where United has overlapping First Class Space, that’ll block out the Lufthansa results. I’m believe that agents are using the same (basic) interface to start with, so they get the same results as we do. If you do need to find this space, ask the agent to direct sell. Let me know if you do find something where there are no first class results yet nothing shows up. Note that with Aeroplan fuel sucharges are imposed on Lufthansa which can be in the hundreds of dollars. Anything I missed? Send me an email/tweet me! Hey Jeff, just checked FlyingBlue for North American routes and there’s no availability showing for Promo Awards. Trying Europe – YYZ, vice versa for December. I wonder if United F costs Aeroplan less than Lufthansa F and so they are deliberately suppressing LH results in favour of UA. No, I just believe it’s the Aeroplan search interface which blocks the LH F from showing, call in and ask for a direct sell. 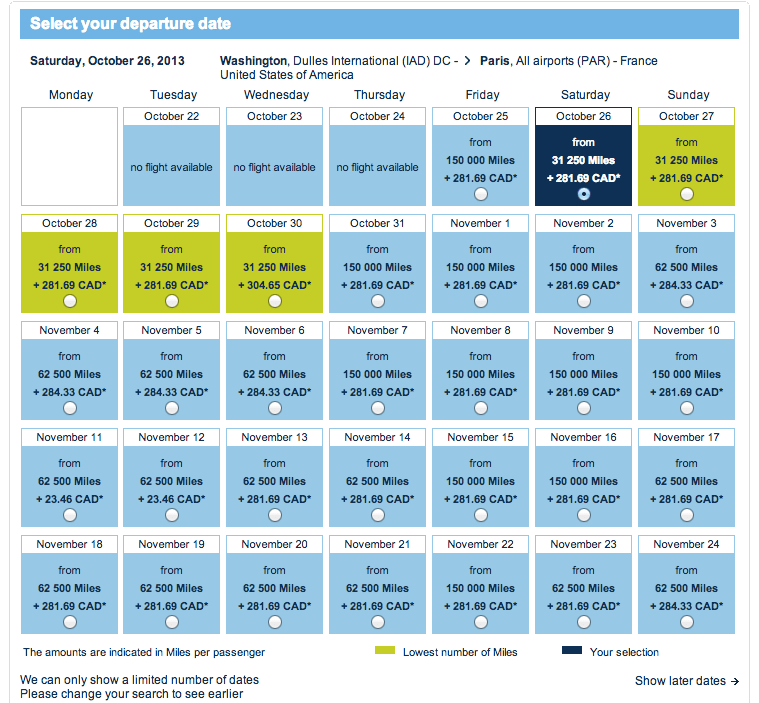 I just checked LH F availability YVR-FRA for Nov. 5 and 6 because the showed up on Expert Flyer yesterday, and those dates do show F available on Aeroplan. I suspect AP would give priority in the listing to UA, but in that case calling in should allow the agent to see the seat.